This is the story of probably the most successful Offshore Radio station to have broadcast off the UK coast. This is the full in-depth story told by the people who made it happen. Paul Rusling explains how he got involved in the project and the various technical and management problems encountered. Transmitter engineer and occasional deejay 'Mighty' Joe Young explains how the vessel was fitted out in Florida USA and the bad weather experienced when the ship made it's Atlantic crossing. Recordings of the famous test transmissions with the balloon aerial and Johnny Lewis with Blake Williams during a test transmission on 729 kHz before they moved to 558 kHz. Hear all the Laser voices again including Ric Harris, David Lee Stone, Jessie Brandon, Steve Masters, Paul Dean, Holly Michaels, Michael Dean, Craig Novak, Chris Carson, Liz West, Erin Kelly, Chuck Cannon, Jay Mack, John Leeds and Jeff Davis. Our specially recorded interviews reveal the frustrations experienced when the aerial collapsed in a storm, the advertising contracts lost by not being on-air and problems caused by management. This in depth documentary not only looks at the inside story, but re-lives the fun and lively atmosphere of the programming, including the famous 'Eurosiege' reports. 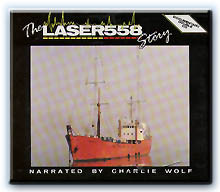 Laser's star deejay Charlie Wolf narrates the story which ends on the 6 November, 1985, when the ship left her anchorage and headed to Harwich. If you were a Laser fan, you'll enjoy this recorded memory. Produced with a full colour sleeve showing many views of the ship, and personalities.